Elephant yam or elephant foot (சேனைக் கிழங்கு) has not been a very popular vegetable in our family. Nonetheless, yam is rich in vitamins A, C and folate, as well as minerals including potassium, phosphorus, magnesium and calcium. In native medicine, yam is used to treat indigestion, loss of appetite, piles and irregular bowel movements. Traditionally yam is used to make kootu or poriyal. I learnt this yam chops recipe from an aunt. It is one of the easiest and tastiest poriyal preparations. Yam chops goes very well with any type of dhal. 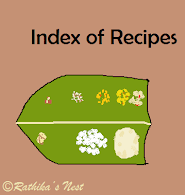 However, you can serve it with rice and sambar or rasam. Just give it a try. Method: Peel and cut the yam into 1” sized cubes. Wash 2-3 times in running water. Drain and keep aside. Cut onion into cubes. Grind onion, tamarind and red chilies into a fine paste using the mixer-grinder. Heat oil in a kadai, add mustard seeds and when they start to sputter, add the onion masala paste. Fry on medium flame till oil separates. Now add yam pieces and turmeric powder. Mix well. Sprinkle 1 tablespoon of water. Cover and cook on low flame stirring every now and then. Yam takes longer time to cook when compared to other tubers. You may sprinkle little more water as required. Once the yam is half cooked, add salt and mix well. Continue to cook till the vegetable is done. Remove the lid and simmer for 3-5 minutes, stirring occasionally till it becomes golden brown in color. Garnish with curry leaves. Switch off the fire, and serve hot with rice and dhal. Note: Some individuals may feel an itchy sensation in the hands while cutting and cleaning elephant yam. To avoid this, apply oil to your hands before handling the vegetable. Do not consume elephant yam if you have known allergy to the vegetable.